I've made this because WattTool has stopped working since driver 17.7.2.
same as above, but with confirmation message that application started and everything went ok. In this example application starts without gui, then sets "myProfile" to GPU with id=0 and "Profile 2" to GPU with id=1 and then exit. 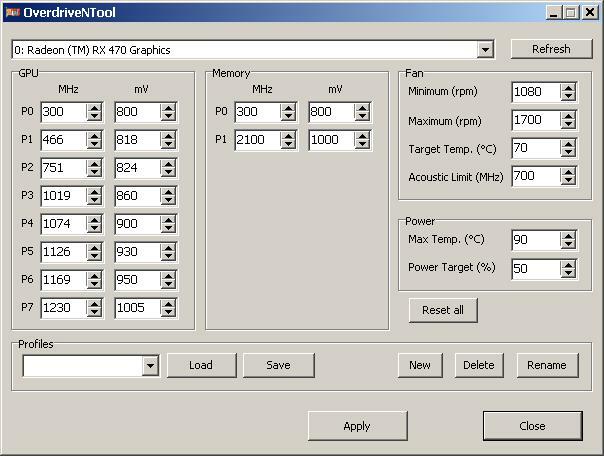 OverdriveNTool.exe -p0myProfile -r0 co1"Profile 1"
On configs with more than 10 GPUs [gpu_id] must have 2 digits, for GPUs 0-9 leading 0 must be added, example: 00,01,02,03,04,05,06,07,08,09,10,11,12. Usage example: -p05"Name"
[value] – value, for GPU and memory PState first value is clock (MHz), second is voltage (mV), third optional ;0 makes this Pstate disabled. -getcurrent - prints current values for all supported GPUs in cmd console window. restart GPU with id=[gpu_id]. It's similar to devices manager enable/disable GPU. Useful for immediately apply registry changes done to AMD keys like SoftPowerPlay table. It requires admin rigths to work. -Workaround for bug in 17.7.2 drivers, when driver sometimes uses default voltages instead of user settings: use reset and re-apply profile. -It's possible to disable/enable each P state. To do this click on P0, P1.. etc. label. If P state is disabled it will not be used by GPU. -If you prefer to not touch fan settings it's possible to deactivate Fan section for each GPU. To do this press Ctrl + double click somewhere on the Fan box. It's saved per gpu_id, so GUI or commandline will not touch fan settings for such GPU. -To open Settings or SoftPowerPlayTable editor left click on top-left program icon, or right click on the titlebar. - added possibility to disable/enable each P state. -changed GPU list sorting to be like in other apps, for easier gpu recognition. -SoftPowerPlayTable editor can now automatically restart GPU when click "Save" or "Delete"
drbobs, Kutep0v, pimpineasy and 12 others like this. THX for share This Great Tool -> is there a chance to have this for Fury? Can't configure fans speed using your tool. Checked some values but seems that default profile is imperative. I tried it on my 390 and it seems to be working, despite not being listed as one of the supported cards. The changes that I make with your tool are shown as being applied inside Radeon Settings and MSI Afterburner. I like your tool, mainly due to the ability to save a profile + the ability to change State 0. Radeon Settings doesn't let me do so, only State 1 through 7. By changing State 0 I don't need to use Clockblocker anymore, which worked well, but this seems like a more elegant solution to me (unless changing State 0 brings with it some risks I'm unaware of, a possibility). Either way, thank you for the tool! I like your tool, mainly due to the ability to save a profile + the ability to change State 0. For Polaris P0 states always revert back to default, are you sure they are changed? If Afterburner and Radeon Settings/Wattman are to be believed, the core clock stays to what I've set it to. If I change every State except 0, my core clock will downclock itself and spike up and down due to activity while I'm idle. And then when I'm playing a game with relatively low requirements it'll sometime be at what I've set it as (1040mhz) and sometime drop down to lower clocks. When I used OverdriveNTool to change every state, including State 0, to 1040mhz, my core clock remains stable at 1040mhz. Even if I'm idle on my desktop, it's at 1040mhz. In games, even after I close a game, it stays there. Afterburner doesn't show the "power limit" changing unless I restart AB, it shows the rest changing. Wattman shows the power limit change. I've tried recording a short video showing it, in it you can see the activity graphs of both AB and Wattman. In AB we see the small spikes and then the solid 1040mhz. In Wattman you can see the orange line, which goes from being low to being solid at a higher level. You can also see the states all being at the same level. I ended up cutting out the end part, where I launched a game, walked around, closed it and looked at the software again before using the "reset all" button to bring everything back to default. When I was doing it everything worked just fine, but the recording software (OBS) stopped recording properly after I opened the game. I think it's because I used the CPU to record and the CPU usage spiked when I opened the game. If it helps you any, I can do the same test later on but record with ReLive + the 'record desktop' option. Nice May i ask why you need such high clocks and voltages in all states? It's power uneficient..
And resetting doesn't reset Fan for you? The 'reset all' button does reset the fan for me, I can hear the fan ramping up or down as I use the tool. The reason I want the high clocks and voltages in all states is only for gaming, I bring them back to default values when I'm not gaming. There are some games where the power requirements can change quite quickly (depending on how much action is happening on screen or how I move the camera around) and when that happens, the card will by default try to change my clocks by itself to give me the power I need while still keeping my clocks low to save power. If the power requirements by the game change too quickly too often, it leads to stutters and I dislike that. I haven't been able to stop that from happening through the drivers themselves, but using your tool to change all of my states (and state 0) fixes that entirely. It'll be inefficient, but it completely fixes the problem and I don't mind being inefficient for as long as I'm gaming. Once I'm done with the game, I bring the values back to default and let the card downclock itself. What drivers and OS are you using for the 390? Windows 10 Anniversary Update. Drivers 17.7.2.
so i have an important note !!! Do you have set 0 in P2 Clock or Voltage? sorry, I do not know how to attach a picture. Yes i understood, can you answer me my questions? I'm afraid I did not understand him a little. I need it easier. Sorry for my english.